Note: A minimum quantity of 16 must be ordered, and in units of 1 thereafter. DYMO by Pelouze Heavy-Duty Mechanical Package Scale, 50lb Capacity, 6 x 4-3/4 Platform - 50 lb. parcel scale features a rate-indicating face. Dial indicates weight and includes a U.S.P.S. (Parcel Post) rate chart. Rugged, stainless steel design withstands heavy use. Larger platform provides more weighing space. 50 lb. capacity covers a wide range of packages. 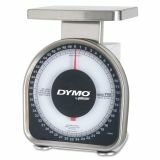 Weight is displayed in pounds. Adjustment knob ensures scale is at zero. Replacement labels are available for future U.S.P.S. rate changes at an additional cost. This scale is not legal for trade. 6" x 4 3/4" 6" x 4 3/4"